One of the joys of getting lost in a book is recognizing things that have happened to you. That’s exactly how I felt as I began to read Shelter Us. While I’ve never experienced the loss of a child, I could relate to how the main character Sarah feels when someone special is taken from her, how you come to terms with it, and how uncomfortable people start to feel around you when they just don’t know what to say. 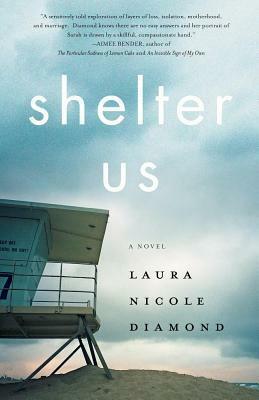 Shelter Us is a moving story told in first person from Sarah’s perspective. I think Ms. Diamond made a great choice using her voice as the narrator. It’s a book that makes me think about many things in my own life and society in general. When Sarah first sees the young homeless woman with her baby, it makes you think that maybe, despite our own problems, we all have something to be grateful for, as does Sarah in this story. Finding the young mother almost becomes an obsession for her and it keeps you reading to find out if she’ll be able to track her down and what the women’s story is, and how she ended up on the streets. As the blurb on the back of the book says, sometimes it is the people we set out to save who save us. I think it sums up Shelter Us beautifully. For me a good book is one that leaves you feeling an emotional tug and that’s exactly what this story did. If you like women’s fiction then I recommend this one to you.